❤️ 8 ornate white framed easel type wooden mini chalkboard sign in 3.7*4.2 inches and 0.03 pounds. ❤️ 8 decorative white framed stand type wooden mini chalkboard sign in 3.5*3.7 inches and 0.02 pounds. ⚡ Easy to write and erase with a damp cloth. ❤️ DECORATIVE 16 PIECE SET WITH 2 CLASSIC DESIGNS - Get 16 pieces of these white framed mini chalkboard signs that comes in two designs; an elegant 3.7 * 4.2 inches A frame easel design and fancy 3.5 * 3.7 standing design. These will fit perfectly on any kind of parties, such as weddings, birthdays, and Christmas. Add a chic touch to table decorations and make each table arrangement stand out. 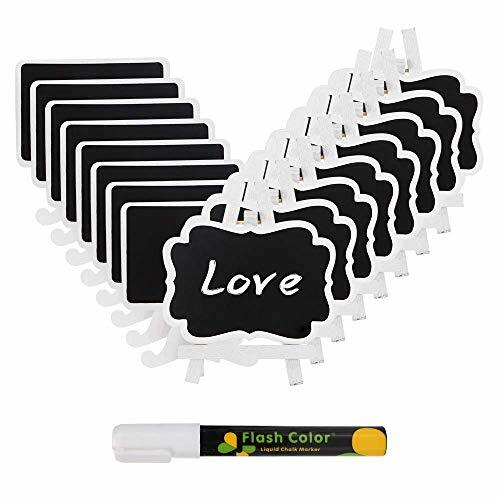 ❤️ REUSABLE, EASY TO WRITE AND ERASE BLACKBOARD SIGN - These long lasting chalkboard slates are long lasting and very easy to use, simply write on with a chalk or chalk marker and wipe with a damp towel to erase and then reuse. There are no residual chalk left on the labels so they are pristine every single use. ❤️ MULTIPURPOSE NONTOXIC LABELS - These are ideal as tabletop decorations, table numbers, food labels, place cards, and message boards. These are food safe so they are safe to place around drinks or food. ❤️ PERFECT GIFT AND WITH A SATISFACTION GUARANTEE - This is a perfect arts and crafts gift for kids, crafters, homemakers, and small business owners and with a 100% Money Back Guarantee, it's a risk free purchase. Add to cart now! If you have any questions about this product by SMALL FISH, contact us by completing and submitting the form below. If you are looking for a specif part number, please include it with your message.